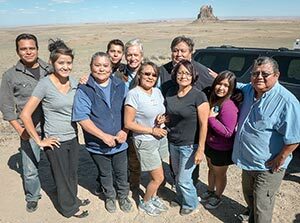 Newcomb was the first New Mexico chapter to get certified under the Local Governance Act, and the fourth in the Navajo Nation. It has easy access to busy U.S. 491, water lines, electrical power and Internet. By now it should be booming. But if you come here, you will see only the one business: the gas station and convenience store that has been there for years. What's the problem? Careful observation reveals that too. The few clumps of grass you see on Newcomb's flat grey plain are grazed down to the roots. This is ranching country, and in this marginal land you'd have better luck asking a rancher for his first-born than an acre from his grazing area. If it's not the cattle, it's the Anasazi. Those circular piles of rock you see as you bump along the dirt roads of Newcomb are ancient kivas, remnants of what archeologists call the Newcomb Site - a major outlying community of the ancient civilization that colonized Chaco Canyon 50 miles east-northeast of here. Basically, you can't stick a shovel in the ground around here without starting a major archeological dig. According to Chapter Manager Lawrence John, a pre-schooler on a Head Start hike once accidentally uncovered some poor blighter's skull. "All the sites we want to develop," lamented John, "the Anasazi are already there." The Ancient Ones might lend this chapter some tourism potential; both John and Chapter President David Randolph Sr. say Chacophiles flock here during the spring equinox, convinced that the alignment of the ruins with the rising sun on that date is no coincidence. But you can't really develop a tourist attraction based on one day a year, and then there are the grazing permittees to contend with (see above). "The new chapter administration," promised Randoph, "is committed to development. But with all the obstacles, it may take us a while to set aside some land." Name: After an early trader, Arthur Newcomb. The area's Navajo name is T'iis Nideeshghiizh, "Cottonwoods Spreading out from the wash." A recent chapter resolution to change the chapter's name to the Navajo version did not pass. The area is also sometimes known as "Nava." History: Newcomb is a relatively new chapter, having broken off from Two Grey Hills in 1981 after residents were frustrated by the distance to the chapter house and their difficulty getting services. But it certainly is not a new area in terms of human habitation, built on the site of a major Chacoan village. 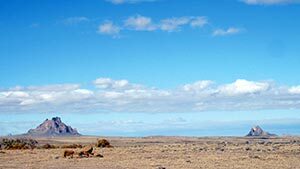 Points of interest: Bennett Peak (6,610 feet) and Ford Butte (6,156 feet), twin volcanic plugs across the highway from each other, provide an imposing entrance to the chapter. There are numerous Anasazi ruins and, on the spring equinox, the area attracts Chacophiles who watch the sun rise from one of the sites. Meanwhile, this chapter 22 miles from Farmington (via the recently paved short cut through Burnham) and 58 miles from Gallup already has a lot more amenities than most. There is education: Head Start through high school; a spacious senior citizens center with a flat screen TV and a pool table; and a thriving veterans organization that likes to give back to the community. Currently the group is procuring welcome signs for Newcomb. There's even a fire station, courtesy of San Juan County, and a regional library, courtesy of the Central Consolidated School District, which offers GED classes in addition to lending books. Both Christian Churches and the Native American Church are big here. "We're sort of a center for the surrounding chapters," noted John. "We provide them with education and shopping at the convenience store." If you want to farm, Newcomb has 103 community farm plots you can reserve, each between one and 40 acres, although the reservoir that was used to irrigate them has all but dried up in the ongoing drought. Newcomb has historically been the site of some horrendous head-on crashes on 491, but with the recent expansion of the highway to four lanes, the injuries seem to be getting less serious, John noted. "We still have accidents," he said. If Newcomb is to develop to its full potential, it will be no accident. It will take some careful diplomacy with the living, and some sort of truce with the dead.